Good morning ! Its definitely a cold one here -17 ! All my Christmas is down and put away..sad face.. Miss it all already ! 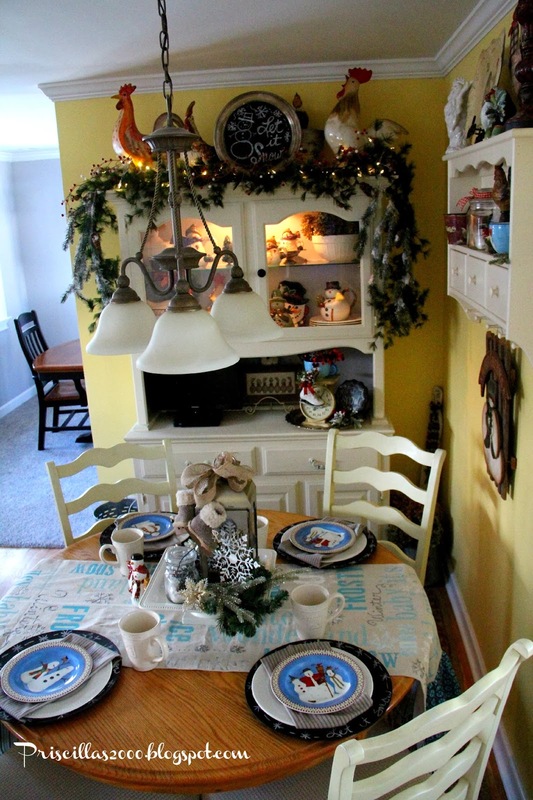 I am sharing our kitchen decorated for winter .. 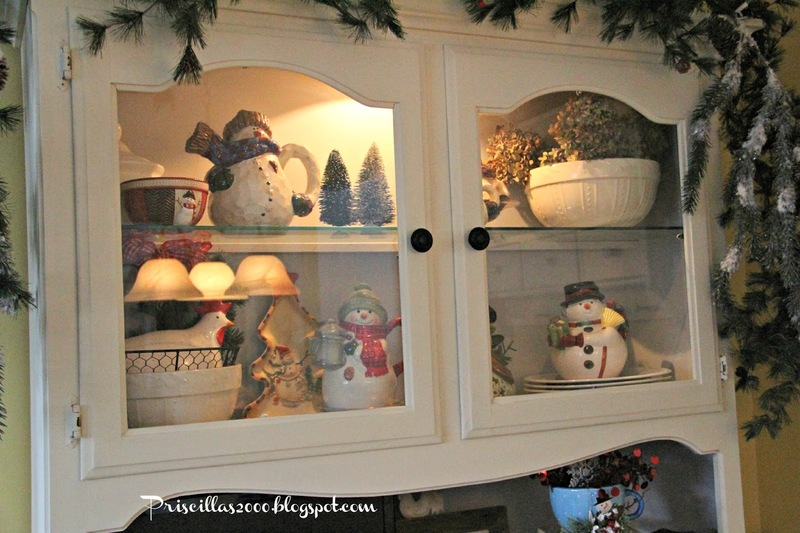 I kept the flocked garland up over my hutch and filled the inside with snowmen.. 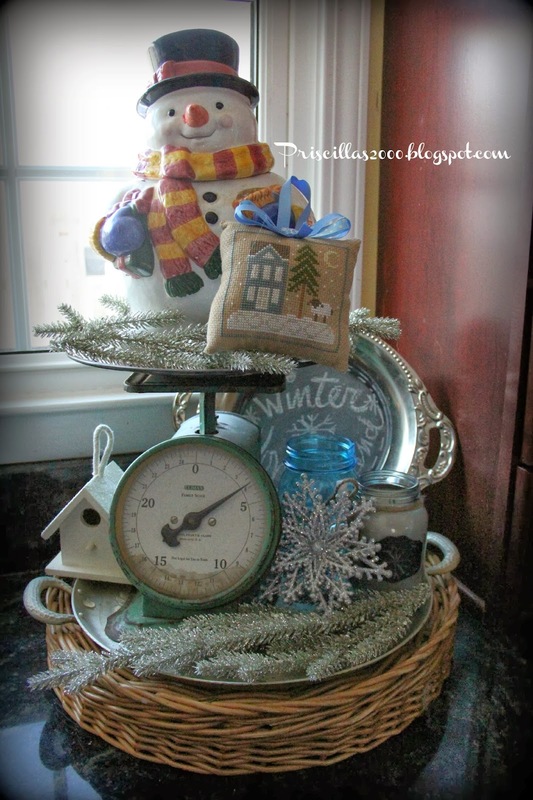 These two winter vignettes are on the counters .. 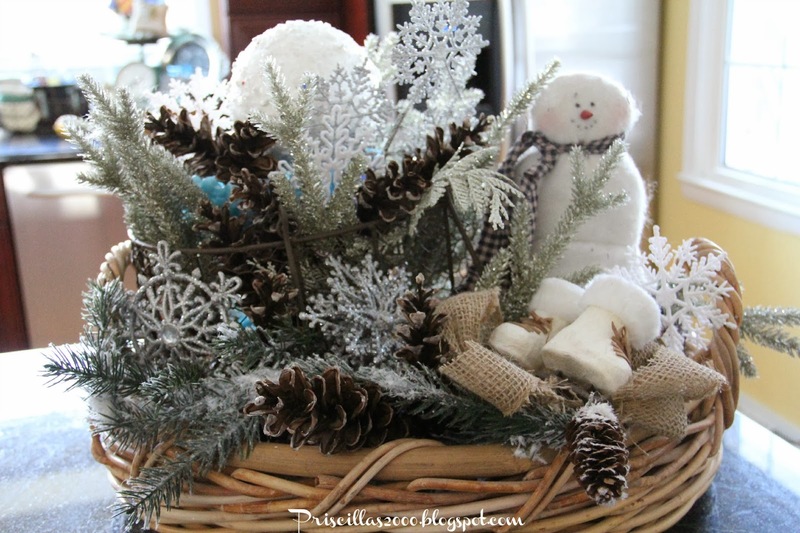 I used pinecones , snowflakes , silver glitter branches, burlap and ice skates in this thrift store basket. I used a snowman cookie jar on top of the vintage scale , with more silver branches, snowflakes a chalkboard and a cross stitch ornament.. 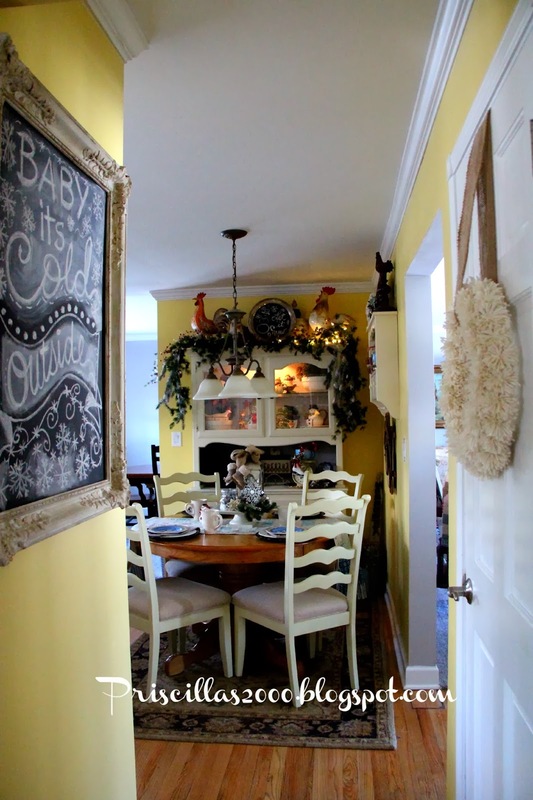 The view from the family room into the kitchen, with the newly winterized chalkboard, and the Anthropologie knockoff wreath now is hanging with a burlap ribbon.. 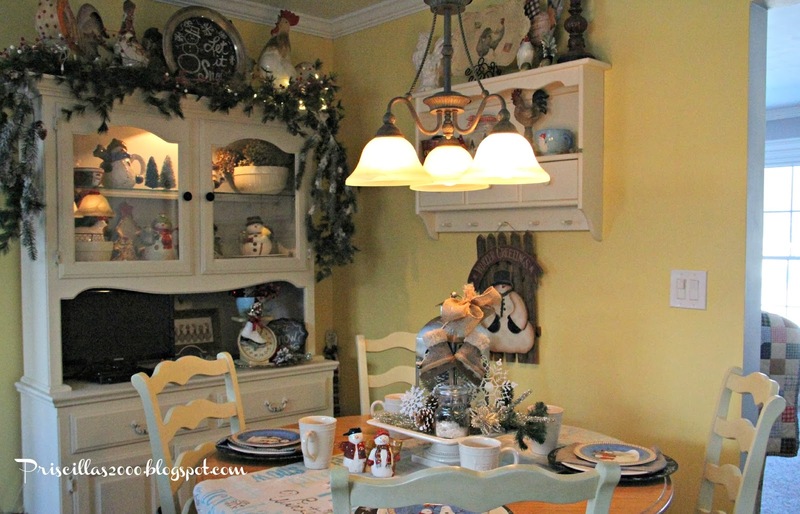 The dining room has winter decorations too, and hopefully I will show you that tomorrow ! I painted these chargers with chalkboard paint and wrote" let it snow "and drew snowflakes around the edges.. I used my Debbie Mumm snowman plates on top of my Dollar Tree white plates. My winter subway art table runner is also on the table.. There is a new winter chalkboard design on the silver tray on top of the hutch..
For the centerpiece on the table I used a silver lantern filled with pinecones, snowflakes and more silver branches. A burlap bow and tweed ice skates hang from the lantern ..There's a snow scene in a mason jar all on top of a pedestal.. If you missed the kitchen decorated for Christmas its here..
Love your blackboard art. White, silver, and blue just scream winter to me, and you've done a great job. Snowmen make a great transition from Christmas to winter. Your kitchen still looks great! I so enjoyed the tour of your kitchen. 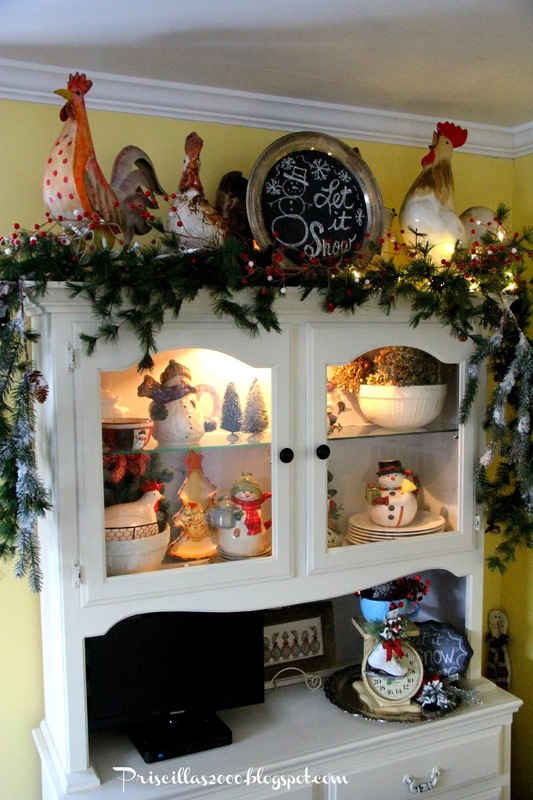 It looks warm and inviting and how clever to use the snowmen, as a transition! Hope it is warm where you are - it is cold outside here!! Everything looks beautiful I love your table. You have a great collection of snowmen. It all looks so beautiful, definitely looks wintery, not Christmassy!!!!! Such a gorgeous transition from Christmas to Winter..and yes, baby it is cold outside!!! Your kitchen is a winter wonderland. Truly beautiful. Great winter décor! I especially like your tablescape with the great centerpiece, runner and Debbie Mom plates! 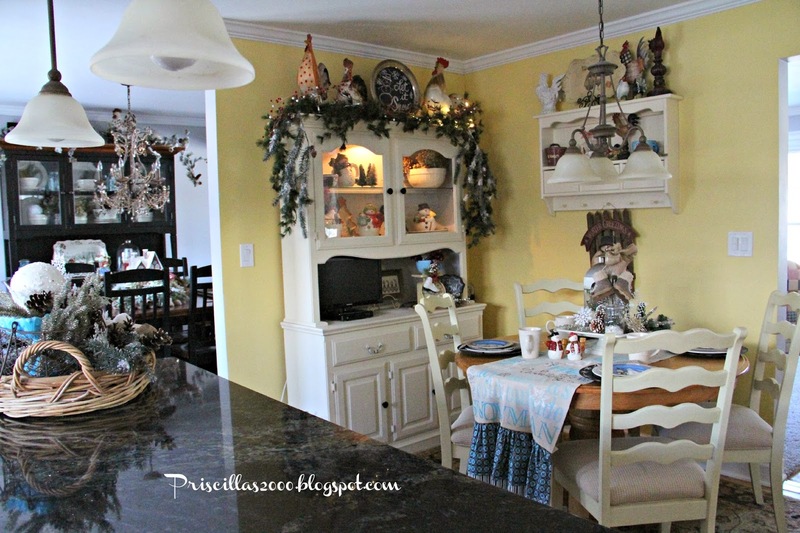 I so love your kitchen and the way you've adorned it for the winter months! I especially love your chalk board!!! 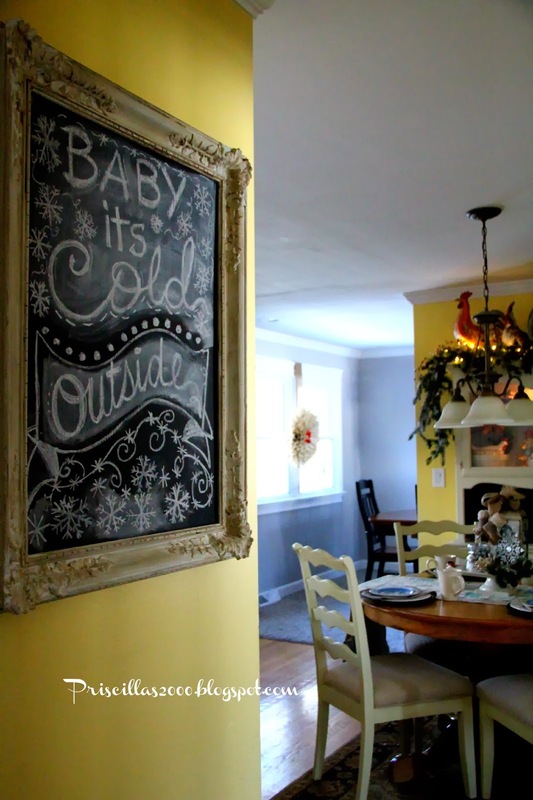 I love your winter chalkboard artwork! You are very talented. 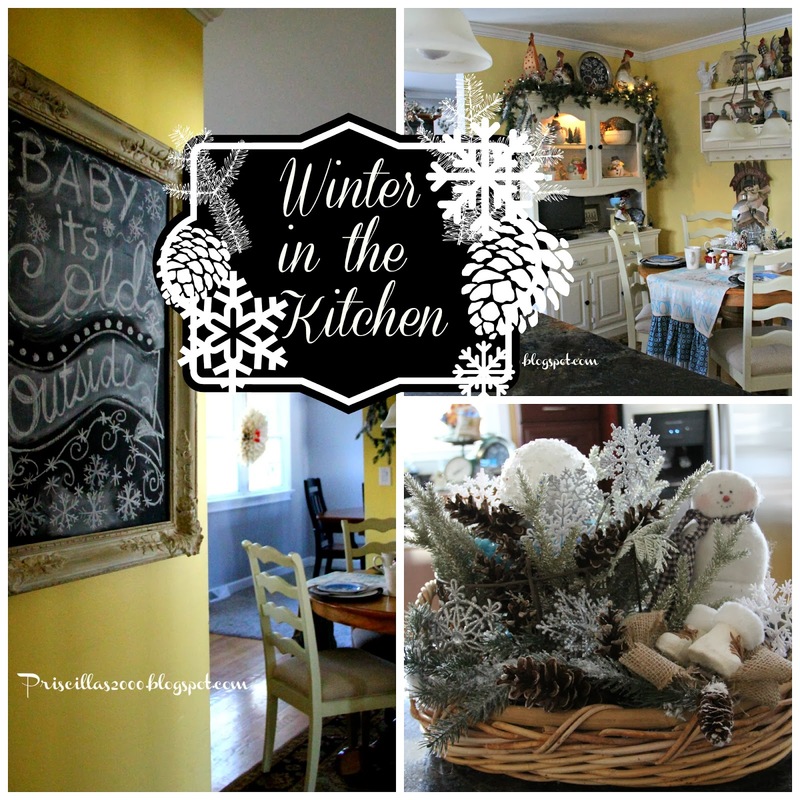 :-) Thanks for sharing your winter kitchen. It's all fun and lovely! 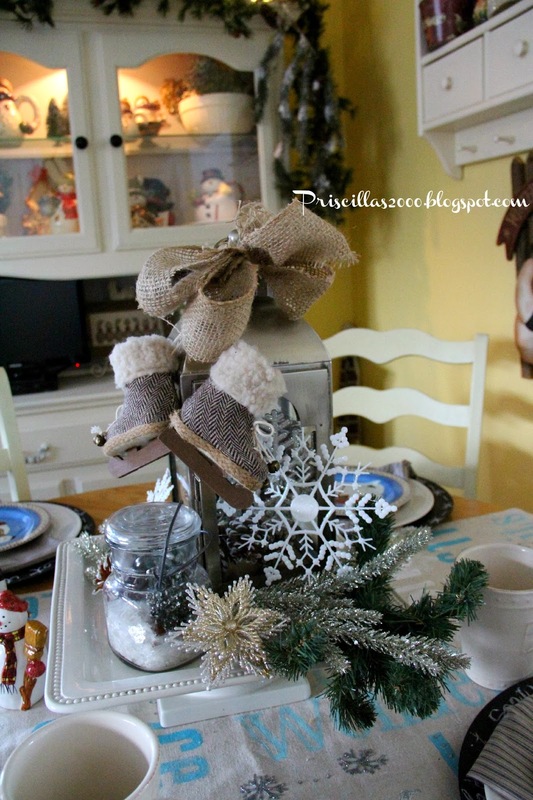 Sweet winter touches, love the snowmen! And your table runner...love it too! Priscilla, your entire home looks so festive for winter. Very clever to paint the chargers with Chalkboard paint. Love it all! Thanks for sharing with SYC. 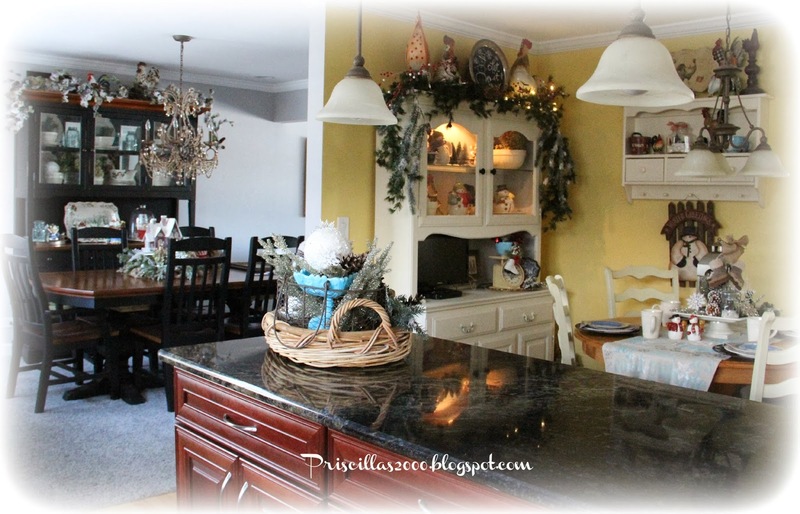 Winter in your kitchen looks so warm and cozy!